North Carolina's Finest Peanuts Make Great Gifts! Aunt Ruby's has put a new twist on a timeless classic with our salt and pepper peanuts. Even top chefs know that a sprinkling of salt and a dash of pepper is all it takes to make the best ingredients shine. Aunt Ruby's Salt and Pepper Peanuts start with gourmet peanuts, lightly roasted to perfection. We add just enough salt to bring out the delicate natural flavor and a bit of pepper for a little kick. 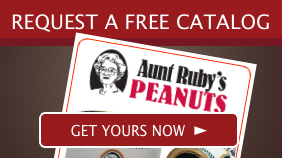 Aunt Ruby's Peanuts has been a family-owned business in Halifax County, North Carolina since 1945. All of our products start with only the highest quality Virginia style peanuts. We are proud to offer North Carolina's finest peanuts online, as well as in our local retail store. Afterall, with a healthy snack this tasty, it would be a shame not share with the whole country. 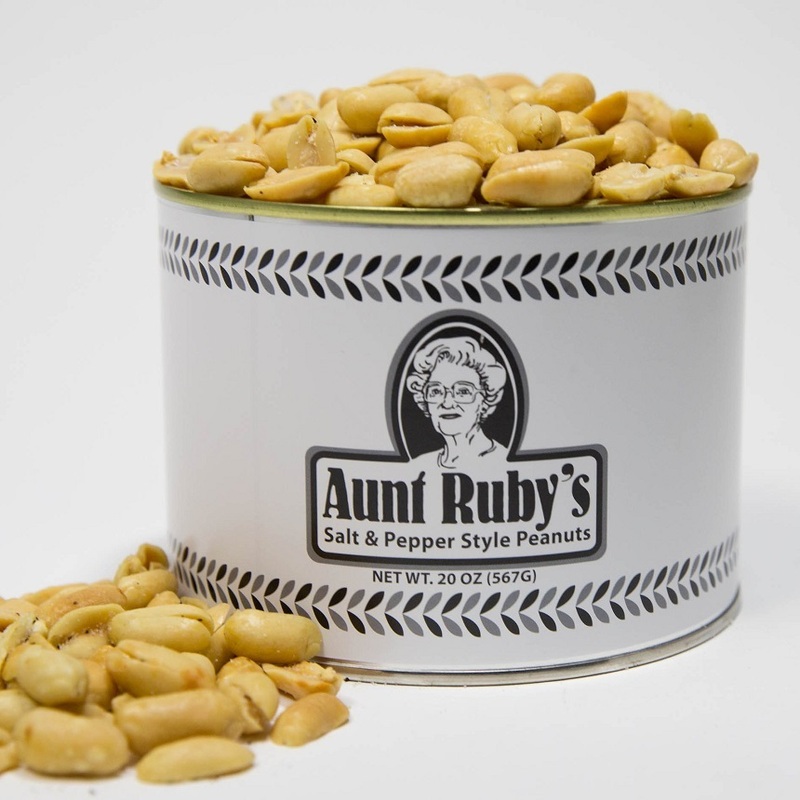 Aunt Ruby's Salt and Pepper Peanuts are available in our signature 20-ounce tins, to lock in freshness. While you can buy just one tin, we offer discounts for the purchase of 4, 12, or 20 tins. Why not share the flavor? Tins of salt and pepper peanuts from Aunt Ruby's make a perfect gift for teachers, co-workers, and friends. We found Aunt Ruby's on a bicycle ride across the US four years ago. Since then we have order the country syle peanuts on a regular basis. Added the Salt and Pepper peanuts to the last order and WOW. I am now in the process of placing a second order of these. Our son got us an assortment of Aunt Rubys Nuts for Christmas this year. We've only opened the Salt & Pepper ones so far and Oh My, we can't buy nuts like this locally. So good! Can't wait to get into the other cans, because I'm here to order more, thanks for a wonderful product! We guarantee you'll love our peanuts and nut items or we'll replace your order! © Copyright 2019 Aunt Ruby's. All Rights Reserved.